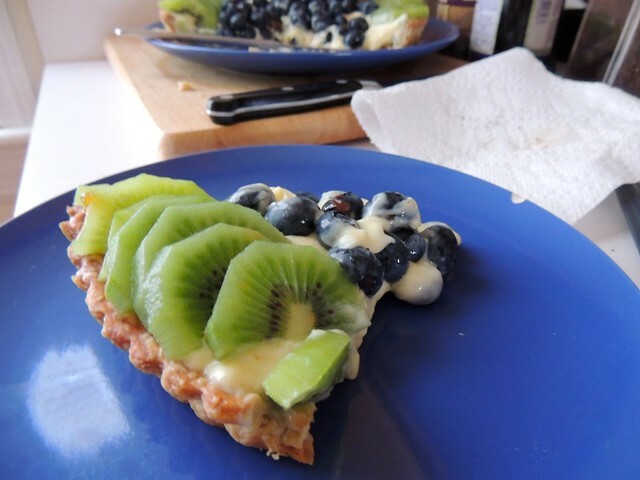 I made my first fresh fruit tart with pastry cream last year for Thanksgiving. Using a recipe from Brown Eyed Baker, which she got from Cook's Illustrated, I assumed I was on my way to success. Unfortunately, the first try was only a semi-success. 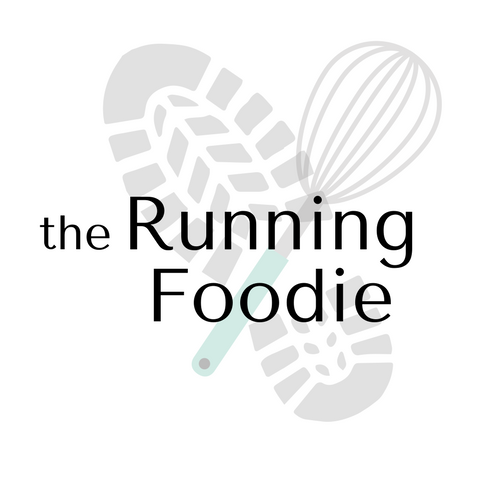 The crust, for me, was a big flop (I couldn't even roll it out), and the pastry cream was a thick, runny sauce. Not one to let a baking disaster get the best of me, I made another tart a week or so later. 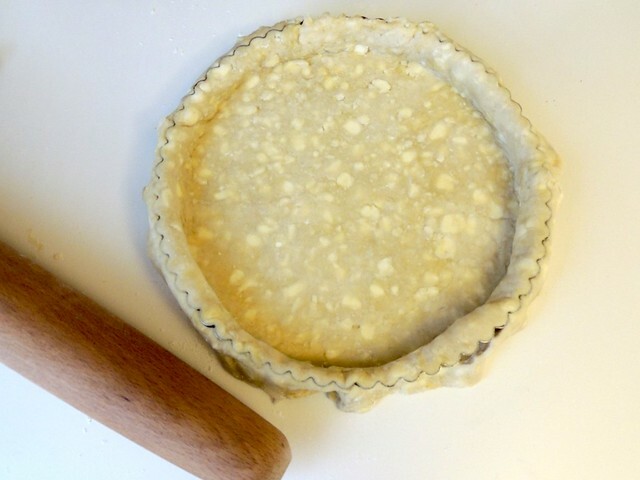 This time, I used my go-to pie crust and increased the corn starch from 3 tablespoons to 5 tablespoons. I remember that tart setting perfectly, though I think the crust was too thick and not tender enough for all the light components. Since I like perfecting things that perplex me, I made another tart a month or so ago using a pate sucree. Unlike a pate brisee, which is a typical butter pastry dough, pate sucree is enriched with more sugar, egg yolks, and depending on the recipe, heavy cream. I followed a Martha Stewart recipe that just used chilled water. As you can tell from the picture above, there are many coarse pieces of butter. Because I made it by hand, I probably didn't cut the butter in as much as I should. You'll see how this (probably) affected the baked crust in a couple of pictures. 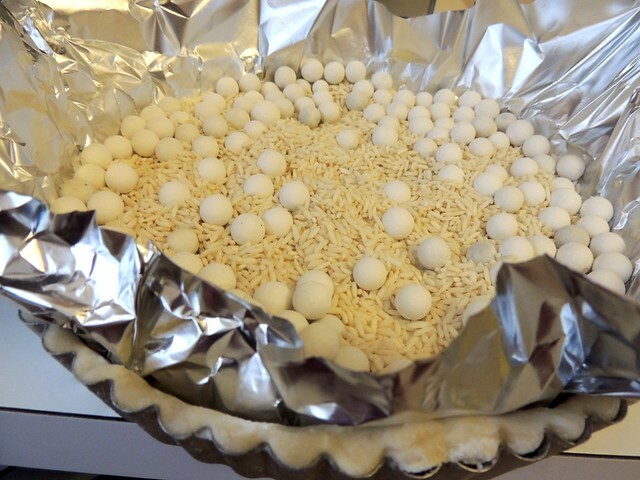 I've found that using a mixture of ceramic pie weights and dried rice keeps the crust from puffing up as it bakes. Don't forget to prick the crust, though. In this picture, you can see that the sides collapsed more than I would have liked, and the crust is oozing grease from the butter chunks, which caused the kitchen to smoke. There was grease everywhere. I have no idea what I did other than that I didn't cut the butter in enough. Obviously, I'll have to try it again. Moving on to the pastry cream. I knew 5 tablespoons would be enough to set the pastry cream, so in my third attempt I used 4 tablespoons. 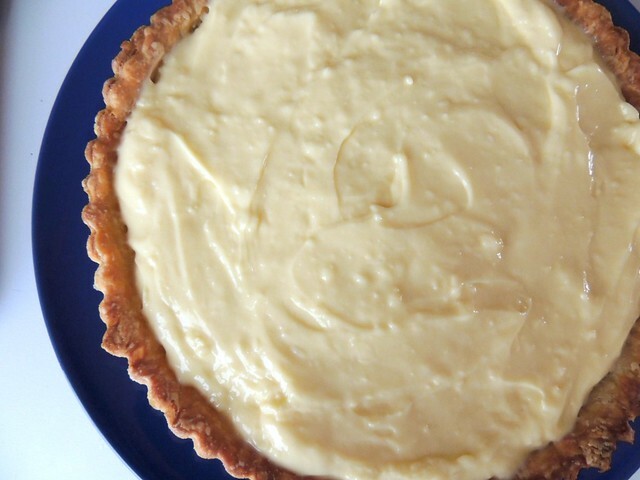 Unfortunately, it wasn't enough and the pasty cream thicken enough for a tart - you're aiming for a clean cut and a pastry cream that withstands the weight of the fruit. In this, my fourth attempt (I think... I'm not very good with numbers), I used 5 tablespoons again. Maybe the temperature was too high, I don't know. 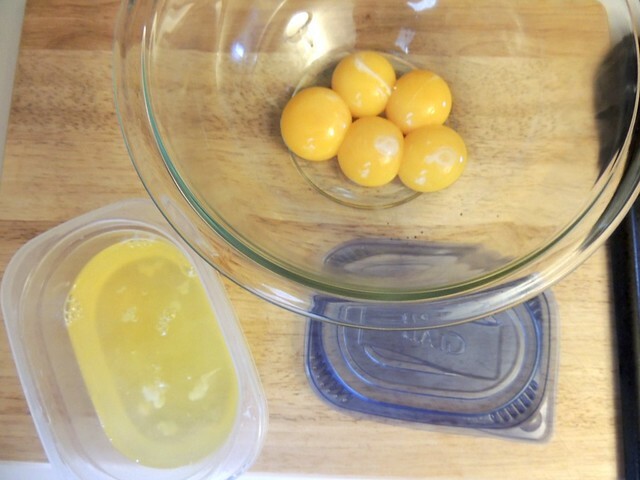 This time, when the pastry cooked and thickened I noticed many little lumps. 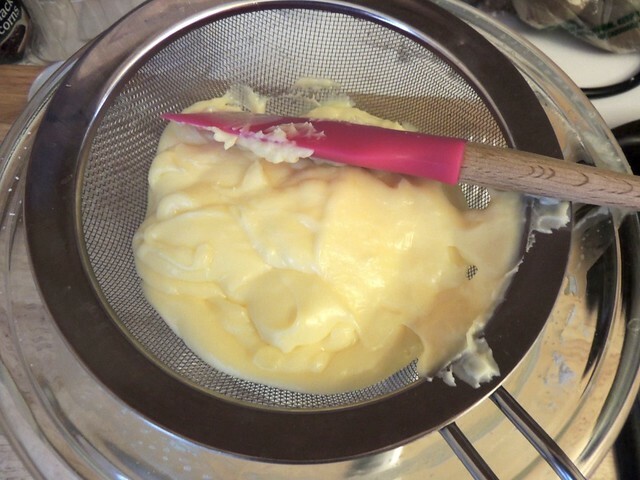 As usual, I pressed the pastry cream through a fine-mesh sieve, hoping the lumps would be pressed away. Only after resting in the refrigerator overnight, the lumps reappeared. I'm thinking that the burner temperature was too high, and no amount of whisking furiously would prevent those lumps from occurring. I know that overcooked corn starch will lose its thickening power, and possibly that's why this batch was not quite as set as the last time I made it correctly. 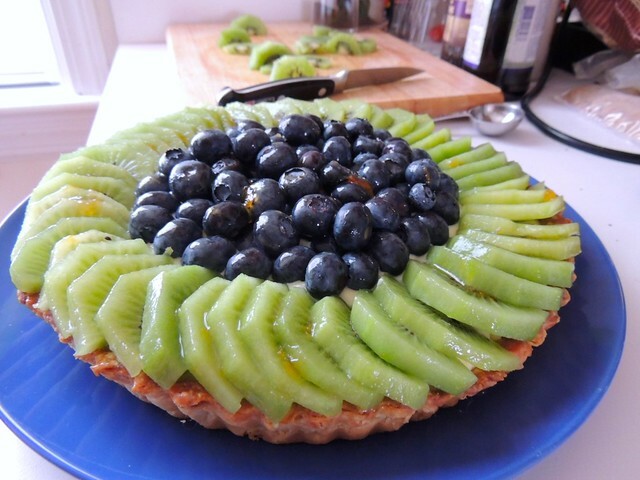 In any case, all tarts look pretty when topped with decoratively placed pieces of fruit. 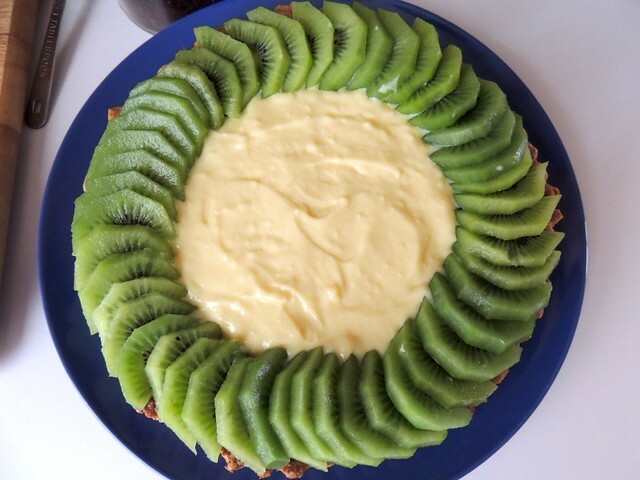 I layered slices of kiwi in a concentric circle around the perimeter of the tart, filled the middle with blueberries, and brushed heated apricot preserves on top for shine. It still isn't the prettiest of slices. Regardless, it tasted really good. 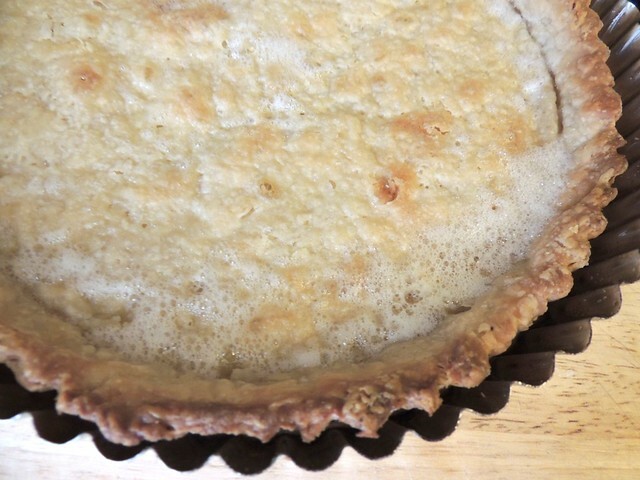 Next time, though, I will try it again with a different crust (I'm looking at a recipe from Bon Appetit) and 5 tablespoons of corn starch in the pastry cream on a lower heat, and other time with the same crust, but 6 tablespoons of corn starch as well as using a lower heat. I liked the colors the most!